Dan Dennett talks about purposely-confusing theology and how it's used. He also describes his new project interviewing clergyman who secretly don't believe anymore, and introduces a new term: "Deepity." 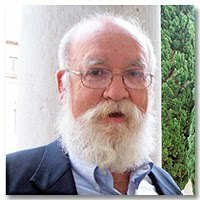 Dan Dennett is the author of many excellent books, including "Breaking the Spell: Religion as a Natural Phenomenon" and "Darwin's Dangerous Idea". He is also featured in the video "The Four Horsemen" along with Richard Dawkins, Sam Harris and Christopher Hitchens.